The application priority deadline is December 1st. The supplemental materials deadline is January 1st. All supplemental materials must be submitted either via email to fsom.graddocs@miami.edu or via US Mail to PO Box 248165, Coral Gables, FL 33124. Not all supplemental materials are required for all degree programs. Please see the Degree Program Requirements for specific requirements. For information regarding specific program requirements, please see Application & Program Requirements. Applicants are responsible for tracking the status of their application materials and should do so on CaneLink. Please allow at least two weeks for documents to be processed and marked as complete. Audition - If your program requires an audition, you will be contacted after the December 1st deadline to schedule a date. Some programs require a prescreening and invitations to audition will be extended to those applicants approved by faculty review. Check the Audition/Portfolio Requirements page for specific requirements. Do not make travel plans until you receive a confirmation email from Frost Admissions. Interview - If your program requires an interview, you will be contacted by department faculty to schedule a date. Portfolio - If your program requires a portfolio, please upload it through SlideRoom. Check the Audition/Portfolio Requirements page for specific requirements. TOEFL/IELTS- Test scores are required for international applicants whose native language is not English and who have not received a degree from an accredited English-speaking institution. Additional information can be found under Application/Program Requirements. Applicants must submit a copy of their passport. If accepted, you will be contacted by the Office of Admission to submit documentation of financial responsibility. Documents in a language other than English must be accompanied by professional, certified English translations. Translations supplement but do not replace, the official documents. The Frost School of Music is requiring international applicants to their programs to complete a course-by-course evaluation with GPA. Josef Silny & Associates (JS&A), Inc. International Education Consultants, is the preferred evaluation service for international applicants to the University of Miami due to their competitive prices and high-quality service. Click here for more information, including the Application for Evaluation of Foreign Educational Credentials. World Education Services (WES) is the second preferred evaluation service for international applicants to the University of Miami. Click here for more information, including the Application for Evaluation of Foreign Educational Credentials. Please note that international applicants are not required to use the services of JS&A or WES exclusively, but the University of Miami requires that an international credential evaluation must be done by one of the approved evaluation vendors found on this list. Applicants who are applying with a current degree in progress will be required to have their final transcripts and diploma evaluated upon arrival at the Frost School. If applicants use Josef Silney for the initial evaluation, the Frost School will cover the evaluation. If applicants choose a different vendor, they will be responsible for the cost of the re-evaluation. 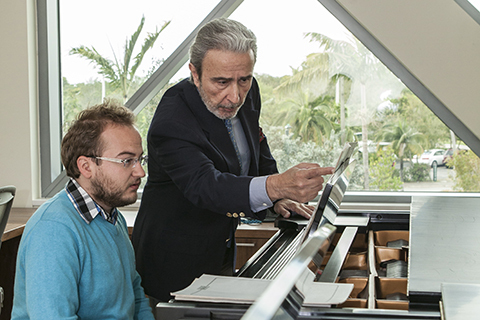 Students are recommended for admission to the Frost School of Music by the faculty and admission committees. Final acceptance to the Graduate program is made after all materials requested by the Frost School of Music have been received and evaluated. Scholarships and/or Assistantships are awarded based on faculty recommendation. Admission decisions are sent out starting in late March. Applicants must be in-progress toward completing or have earned the appropriate prior music degree(s) from a regionally accredited institution in order to apply for a graduate level music program. If you are accepted and decide to attend the Frost School, you will be required to provide a final transcript showing a conferred degree. The MM in Music Business & Entertainment Industries and the MA in Arts Presenting & Live Entertainment Management do not require prior music degrees. The MS in Music Engineering Technology is open to students who have completed an undergraduate degree in an appropriate engineering/science field.